The new Cat® MH3037 is the first in a series of the new wheeled material handler line that Caterpillar is introducing in the greater than 25-metric tonne size class. The new material handlers are purpose-built from the ground up to work productively and durably in industrial, scrap recycling, millyard and waterway and port applications, while affording maximum protection and convenience for the operator. The patented Cat ground-level-entry/exit design features a step-in cab that lowers to the front or the side of the machine to enhance convenience and safety for operators and service personnel. The MH3037 has an operating weight of 39,500kg and is powered by a Cat C7.1 ACERTTM engine that meets US EPA Tier 4 Final/EU Stage IV emission standards. The engine features an electronically controlled, mechanically actuated, unit-injector fuel system that uses multiple-injection fuel delivery for optimum power and economy in all operating situations.The MH3037 configuration is rated at 225 horsepower (168kW). Major structures use continuous welds that incorporate extensive chamfering and beveling to reduce stress concentration. Booms and sticks are constructed from single- piece top and side plates to eliminate the need for seams and internal baffles. The upper frame is designed specifically to dissipate loads transferred through the front linkage and counterweight, and the lower frame has a unique tapered design for evenly distributing loads and reducing stress. Oversized pins and bushings strengthen pivot points. In addition, extensive finite element analysis and strain-gauge testing throughout the design process help ensure long term durability. Along with an 8.8m boom, the MH3037 can be equipped with a short 5.8m version or a longer 7.2m front configuration to best fit the application. The MH3037 uses a closed-centre, one-pump, load-sensing implement hydraulic system with electro-hydraulic pilot control. The hydraulic pump generates only as much oil flow and pressure as required for the application, yielding powerful, rapid response and fuel-saving efficiency. To further enhance overall hydraulic power and efficiency, the machine regenerates boom- down oil flow, reducing the volume of oil the pump must produce. The hydraulic oil cooler, engine air-to-air aftercooler (ATAAC), and engine radiator are all mounted side-by-side to reduce clogging caused by airborne debris and to provide better access for cleaning when necessary. The auto-reversing fan used in the hydraulic cooling system ensures that optimum temperatures between 54°C and 60°C are maintained, protecting oil quality, extending component life and promoting optimum machine performance. The powertrain of the MH3037 incorporates limited-slip differentials on both the front and rear axles to provide true all- wheel-drive performance. A variable displacement hydraulic motor, coupled with a two-speed transmission, provides high- and low-speed travel and creeper-speed capability. An oscillating rear axle with an oscillation lock provides the capability to work on- rubber in rough, uneven terrain, maintaining stability without stabilizers deployed. The hydraulic cab-riser system allows cab height to be adjusted up to an eye level of 5.5m. Raise time from ground level to maximum height is approximately 8 seconds; lowering time from maximum height to ground level is ten seconds. Adjustable sensors control the height of the cab above the ground, and manual override valves in the cab and at ground level allow the cab to be lowered in the event of engine power loss, ensuring that the operator can exit safely at ground level. tool contact with the cab, and load-holding valves on hydraulic cylinders prevent sudden uncontrolled drop of the boom, stick, cab, or stabilizers in the event of a failed hydraulic hose. The cab also includes a polycarbonate skylight, removable panels, and a rear window that serves as an emergency exit. Images from the standard rearview camera are displayed via a high-definition colour monitor. A separate monitor displays operating parameters, starting fluid levels, machine warnings, and activated work functions. The system allows operators to set functions according to preference and provides maintenance reminders, diagnostic capabilities, and out-of-specification alerts. To assist customers in improving jobsite efficiency, lowering owning and operating costs and managing the MH3037 for optimum return on investment, Cat Connect offers LINK and DETECT technologies. Product LinkTM allows fleet owners to wirelessly track machine location, hours, fuel consumption, idle time, events codes, and diagnostic codes via the online VisionLink® user interface. A rear vision camera greatly enhances job site visibility to help the operator work more productively. The MH3037 can handle a variety of work tools. The machine features medium-pressure flow from a separate valve for tool rotation and a high-pressure circuit from the main pump to operate the open/close functions of typical tools, such as orange- peel grapples, clamshells, and log grapples. A separate pump is used to provide hydraulic power for operating an available scrap- magnet generator. The generator features a patented Cat solid- state magnet controller that eliminates typical maintenance issues and is supported and warranted through Cat dealers. RDS Technology’s LOADEX 100 is a retrofittable scale installed on both tracked and wheeled 360° excavators and material handling machines to weigh the amount of material in the bucket, grab or clamshell. A minimum of two pressure sensors is installed into the hydraulic lift system. The pressure signals are captured, filtered and corrected by measurements taken by an inclinometer. Slope corrections are made from another inclination sensor on the chassis. When used dynamically, the pressures are captured through a set weighing zone. The system may also be used in static weighing mode; the boom can either be lifted to a set weighing position where the pressure is captured, or measuring constantly in a ‘live’ mode at any required boom height. Both dynamic and static weighing positions are adjustable by the operator to suit any job required, which will enable the machine to be used at its most efficient output. Dipper arm position is established by a mechanical angle sensor mounted on the boom to dipper arm pivot. This provides fast and precise dipper arm angle measurement that is not affected by inertia G-forces or acceleration effects. As an added option, oil temperature compensation can be provided by a clamp-on temperature sensor. Ultrasonic technology provides accurate bucket position compensation. The final calculation is sent via CAN protocol to the LOADEX 100 cabin terminal. Load and store information is saved in the terminal where it can be distributed to an in-cab printer, modem or internal SD flash card. Heavy crane lift specialists, Havator of Tornio, Finland, maintains a heavy booking schedule for one of its oldest, more versatile and most reliable cranes in its fleet, a 2001-vintage Terex® CC 2800 lattice boom crawler crane. Often the 600-tonne (660-US ton) crane moves from job to job, never receiving a reprieve at the lifting company’s home office. Last lifting season is a prime example of just how much business Havator books for the CC 2800 crane. Over a relatively short period of time, the company moved the versatile Terex crane three times, logging over 350km (217mi), for three very different applications. Havator first used the crawler crane in an industrial application, changing 62-tonne (68-US ton) process washers at a paper mill in Pietarsaari, Finland. Crew members then loaded the crane on 15 trailers, plus three heavy haulers for the crane superstructure and crawlers, and led the convoy 250km (155mi) north over a three-day journey to Oulu for changing electric plant filters at the Toppila Power Station. The third leg of the trip saw the crane moving another 100km (62mi) north by land and then barged to an island for a windmill project to switch out turbine gears. “The CC 2800 crane is fast to assemble and disassemble, quite easy to transport and flexible enough to be used on many different projects,” says Logistics Manager for Havator, Matti Simola. “We use it for industrial and windmill projects, but the lumber industry is where we use it most. This is just one of 60 Terex cranes we have in our fleet,” he continues. One of the largest peat-fired power stations in the world, the Toppila Power Station generates 210MW of electric power and 340MW of thermal power. The four massive air filters pull from the airstream the particulate matter generated by the peat- burning process. The filters are changed on a 20-year cycle. “The filters are typically covered with dust, rust and other items, which can increase the filters’ weight,” comments Simola. The 600-tonne (660-US-ton)-capacity Terex crane was up to the challenge posed by the unknown. 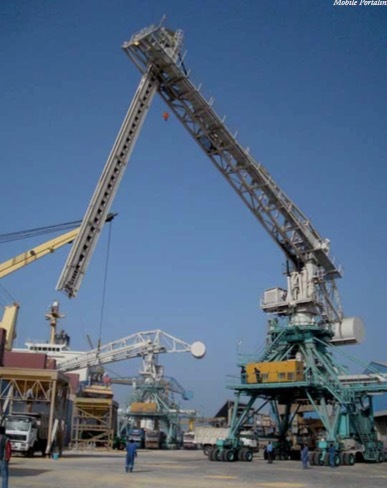 Havator configured the crane with its heavy boom segments, constructed the 42m (138ft)-long main boom and added a 30m (98ft) luffing jib to reach the required 65m (213ft) hook height for filter removal. Since space was at a premium at the electric plant site, Havator chose the short boom/jib configuration and worked at a relatively narrow radius, ranging from 24m to 27m (79ft to 89ft). “At the minimum radius in this configuration, the CC 2800 crane offers a lift capacity of up to 227 tonnes (250 US tons) and 205.5-tonne (226.5-US ton) capacity at the maximum working radius, so we built in extra lift capacity to account for the possibility of additional weight with the used filters,” adds Simola. Once on site, Havator’s rigging crew took just 2.5 days to set up the crane. This included additional steps required to meet the strict 15t/m2 (1.5 US ton/ft2) ground load pressure limit. Even though the crane’s weight is spread over its large crawler tracks’ 31m2 (332ft2) area, the CC 2800 crane could not reach the relatively low load limit for the job. “We had to strictly adhere to the ground load pressure limit, because of the risk of damaging the many pipes and canals running under the ground,” explains Simola. “We placed multiple special kinds of pontoon plates under the lifting/driving area. They are approximately 6.5m long by 3.5m wide by 0.6m thick (21.3 x 11.5 x 2.0ft).” For contractors that often face applications with low ground load pressure restrictions,Terex offers 1.8m (4.9ft)-wide crawler tracks, so weight can be disbursed over a wider area. Over the next week and a half, Havator’s two crane operators, supervisor and radioman used the Terex CC 2800 crawler crane to perform the eight major picks — four to remove the old filters and four to install the new — and several minor lifts. “We had to carry the load of the old filters over a distance, so it was necessary to use the crawler crane,” says Simola. The used filters were placed on a special Havator trailer that carried them over to the assigned storage location, approximately 300m (984ft) from the lift area. The CC 2800 crane performed flawlessly removing and replacing the 20m-long by 10m-deep by 20m-high (65.6 x 32.8 x 65.6ft) filters. “Everything went well,” says Simola. “We worked according to plan and completed the job on time.” Then the crews quickly dismantled the crane, loaded it back onto the 15 trailers and three heavy trailers, and moved it to Kemi for the windmill project. A company dedicated to crane services, special transport, section assembly and harbor crane services, Havator’s operations reach the Finland, Sweden, Norway, Russian and Baltic States market areas. Started in 1947 as a family business in Tornio, Finland, Havator has grown throughout the decades into a multinational corporation with more than 600 employees and group sales of over €100 million. Terex Corporation is a lifting and material handling solutions company reporting in five business segments:AerialWork Platforms, Construction, Cranes, Material Handling & Port Solutions and Materials Processing. Terex manufactures a broad range of equipment serving customers in various industries, including the construction, infrastructure, manufacturing, shipping, transportation, refining, energy, utility, quarrying and mining industries. Terex offers financial products and services to assist in the acquisition of Terex equipment through Terex Financial Services. Terex uses its website and Facebook page to make information available to its investors and the market. The largest wheel loader in the Hitachi range has been delivered to Lasa Marmo’s Whitewater marble quarry near the village of Laas in northern Italy. The new ZW550-5’s main function is to lift each marble block that has been extracted from the cavernous site — situated 1,600m above sea level — and transport it through a series of passageways to an outdoor storage area. The ZW550-5 was delivered in December 2014 by Comac, a sub-dealer of the Italian Hitachi dealer for construction machinery, SCAI SpA. The fuel consumption is described as ‘brilliant’ — on average eight litres per hour better than the previous machine — by Erich Tscholl, Lasa Marmo’s Operations Manager. It was supplied with a bucket and fork attachment, which is utilized through 80% of the machine’s operations. Lasa Marmo’s decision-making process for the purchase of the wheel loader was made by comparing three machines across five important criteria: the purchase price; after- sales service; performance and lifting power; agility and manoeuvrability; and size of the machine. Tscholl summarizes their conclusions: “The Hitachi’s hydraulics were better and the traction power was stronger — even when travelling up the steepest hill. We spoke to the operator of the previous ZW550 model and carried out some tests with the machine, such as travelling fully loaded uphill. Overall, the Hitachi performed better than the other two brands. Operator Roland Spechtenhauser has found the machine to be incredibly user-friendly:“It was easy to learn how to operate the ZW550-5 and it already felt like it was part of me after only a few days. The sensitivity of the levers is one of the machine’s strengths — it does exactly what you want it to do, even to the nearest centimetre. Whitewater quarry is the area’s main source of the 400 million-year-old metamorphic rock — an exceptionally hard and durable material, which is resistant to harsh and adverse weather conditions. With an estimated 30 million cubic metres of marble remaining to be quarried over the next 500 years, it is one of the largest natural resources of its kind on the planet. Lasa Marmo currently has a 30-year lease for Whitewater and two other historic quarries up until 2033. Between 2,000 and 4,500m3 of marble are quarried each year, and the company places a strong emphasis on processing the raw materials in Laas. This helps it to contribute to local industry and the region’s artistic traditions, as well as work as a partner with the local authorities for the protection of the area’s natural beauty. Buhler specializes in solutions for grain terminals, being it loading or unloading, writes Vincent Van der Wijk, Product Manager Ship loading and unloading equipment. In the field of continuous unloaders and unloaders, Buhler manufactures both mechanical and pneumatic unloaders. Its popular Portalink and Portaload models are available as both stationary and mobile units. The mobile Portalink is the mechanical unloader for sea going ships up of to 125,000dwt. It has an unloading capacity from 300tph (tonnes per hour) to 1,300tph, and boasts top-of-the- class operating costs through low energy usage, low maintenance, and easy operating use. Buhler’s loading equipment is based on the same two loading principles, and offers capacities ranging from 800tph to 3,000tph. The company’s stationary Portaload is based on three to four loading towers which are trimmed for maximum performance and designed for continuous loading. The mobile Portaload is completely revised to eliminate any hydraulics, minimal energy usage, low stress on the quay, and easy operating use. Buhler’s mobile equipment handles all free flowing food products and mealy products like soya meal. Its mechanical loaders and unloaders can efficiently handle the delicate product characteristics of the products and have a clear customer advantage regarding lower operating costs and increased efficiency due to the easy and auto sink-in and lower-out function. Buhler is maintaining a leading role in the marketplace by actively adapting the product portfolios and setting new standards by introducing new technology. A prime example is Buhler’s mechanical ship unloaders. At an early stage, Buhler identified that vertical mechanical conveying, when compared to pneumatic conveying for example, is not only very efficient but has also significantly reduced product breakage through gentle product handling. In addition, the company’s machines means that it is possible to handle and process grains economically, adding a further dimension. Through its world-wide network of experts, Buhler solves its customers’ problems with the greatest care and with specific attention to each problem. Major clients of Buhler for mobile harbour equipment are naturally the large trading and exporting facilities demanding reliable, high capacity, efficient loading and unloading equipment having low operating costs, but also direct end-users such as millers, brewers, feed plants, etc. are trusted and important customers for Buhler. In order to remain competitive in the marketplace, Buhler is always looking for new developments and product improvements, and constantly tries out new materials. The company’s latest development is the complete revision of the mobile loader, combining market and customer feedback and internal expert knowledge. The new mobile loader has been designed focused on the main functions of loading product as efficiently as possible, and ease of use during operations. With this in mind, Bu¨hler has created the Mobile Portaload, which has no hydraulics, removing complex equipment where possible, increasing the ease of operating. The direct result of less complexity and fewer parts means is higher availability! Another benefit is the low weight and power usage of the Mobile Portaload. The low power consumption is setting a new standard in the market, where the lower weight reduces the requirements of current pier installations. v two large Portalinks with a nominal capacity of 1,200tph and capable of handling Panamax II-class vessels. Combined with the revision of the mobile loader, the operating system has fully been upgraded to the latest market standard. The latest operating system has increasing functionalities such as a touch panel directly presenting error messages, individual selection of each motor and sensor, saving precious time during loading and unloading. A detailed picture of the installation integrated in the software where the individual sensors are situated makes it even easier to identify and optimize the operating efficiency. Every day, billions of people use Buhler technologies to satisfy their basic needs for food, mobility, or communication. With its industrial process technologies and solutions, Buhler makes a significant contribution to feeding the world’s population while focusing on food safety and security. Around 65% of the wheat harvested worldwide is processed into flour on Buhler mills. The company’s contribution to the global production and processing of rice, pasta, chocolate, and breakfast cereals is equally substantial. Furthermore, Buhler is a leading solution provider of die casting, wet grinding, and surface coating technologies, with a focus on applications in the automotive, optics, electronics, printing, packaging and glass technologies. The solutions provided to these industries are characterized by high energy efficiency and sustainable mobility. As a leading technology group, Buhler invests up to 5% of its turnover in research and development every year. Buhler is proud of its Swiss roots, with 10,600 employees at some 140 sites generating sales of CHF 2.3 billion. As a family-owned company, Buhler feels particularly committed to sustainability.